Even though my dining table won't actually be used for dining this season I decided to go ahead and dress it up so I could finish my vision. Don't worry- we'll be sharing great food and visiting with family but at a different home this year! This is the table finished and ready for dining! I created the height with the hurricanes and artificial florals and I brought in different candle holders to create a mix of heights and interesting things to look at. have different designed pieces they offer at different times of the year for mixing with these. My Wallace, Euro Beads gold flatware got used once again! gold rim and fleur-de-lis design. Since fleur-de-lis was on my mind I brought out these napkins with the fleur-de-lis embroidered on them. Reindeer adorn the center of the table and many candles, votives and hurricanes. 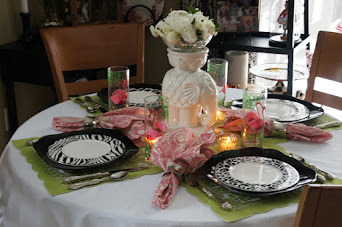 Maybe next year I'll get a chance to serve up a meal and use my pretty table place settings! Until then I'll just keep the dream alive! Liz, this table is absolutely gorgeous! I love all of the red that you implemented and the various heights!! So festive!! Those fleur de lis napkins just stole my heart! I love those soooo much!! The Macy's dishes are wonderful! You were so smart to buy a collection that can be restyled and added to! Your table is just stunning! Oh Liz you've done an amazing job with your table. It's elegant and inviting. Wishing you a peaceful holiday season and a New Year overflowing with good health and prosperity. Your tablescape is Gorgeous all the way from your Beautiful China to your lovely centerpiece !!! You did a lovely job putting this together for your Christmas Holiday dinner party's. 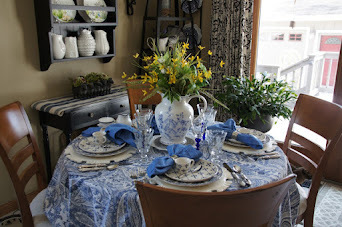 I would like to thank you so much for your sweet comments on my new Christmas Tablescap in blue. I hope you have a wonderful week Liz with your family. Your tablescape is just gorgeous! I didn't know that the Mikasa goblets came in red. They are beautiful along with your china that's rimmed in red and your hurricanes. I'm glad you shared where you got your chargers because I'm looking for some red ones. I hope you get to use this table next year. I have seen Mary Carol Garrity's dining room in person several times. One of my all time favorites. This is just beautiful! I love red for Christmas too. Your goblets are beautiful and with your china...stunning! Happy Christmas! I think I saw this without the place settings, right? but wow! it looks even more beautiful with them!! Beautiful china and those napkins are absolutely gorgeous! Arrangements are still exquisite--it's such a lovely table and the colors are so elegant together!!! Photos are sooo pretty!! 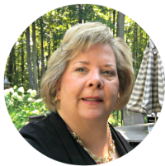 I just LOVE your tablescape, it is just stunning and your centerpiece is beautiful. 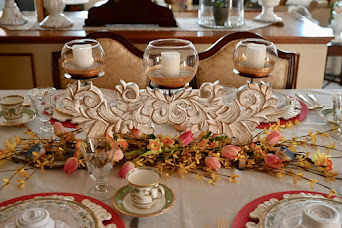 Your inspiration table is lovely and your creation is so elegant and festive! I love the red vases filled with all those natural elements. Your stemware is gorgeous and the layers of dishes are fabulous and so rich! Really love this Christmas tablescape and all the pretty elements you added. Just beautiful! Your table is so beautiful. I usually like something a little less traditional, but your table has be converted back to red! So pretty, thanks for sharing. Gorgeous, gorgeous table...the china is beautiful. The oversized floral arrangements really add so much to an already gorgeous table. Thanks for sharing, Liz! Your table and china are so elegant. I love the tall vases, very dramatic. I love your inspiration photo. I would love to talk my husband into painting my dining room walls black (maybe above white wainscoting). Liz, I LOVE this table! It is definitely in my top three holiday tables! I love every single element you used, from the beautiful dishes to the gorgeous deer to the symphony of candles! Just wonderful!!! How elegant! Red and gold is just so lovely at holiday time. That tablecloth is amazing. How did I miss seeing that one? What a gorgeous and elegant table. Your china is fabulous and I love your reindeer centerpiece. Thank you for leaving a comment on my mauve Christmas tablescape ☺ My first ever tablescape actually. Thank you for visiting, please visit again. Liz, your table is absolutely beautiful! I love it more than the Nell Hill table. Love the staggered heights...really lovely! Your china is beautiful! I love that they have different accent plates during the year. You'll have so much fun with that. Love, love, love that your stemware coordinates with your napkins...amazing! It's all so beautiful! 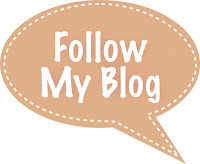 So glad you are blogging and joining in. Merry Christmas to you and your family! Thank you for dressing your table for us even though you won't be celebrating at home. Everything is gorgeous. I love the reindeer. What a wonderfully festive and inviting table you've set! 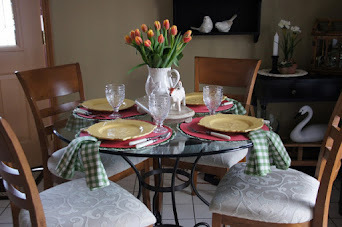 I love your poinsettia tablecloth...such a perfect starting point for this fabulous table! I think it's fun to set the table up, even if you're not going to use it...it's nice to see it everyday looking so alive! Oh, your table is just gorgeous! I love the red urns so that are so lushly filled and your reindeer are majestic! I'm going to head over to Macys to check out that dinnerware. I am a little late on this, so don't know if you will read it, but I love, love, love this. What fabulous plates and so classic, you will love them for a lifetime. The huge red vases are amazing. So rich and beautiful. 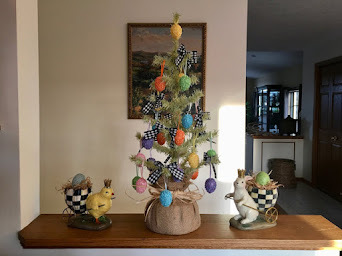 This could stay up all season, it is perfect. Spectacular! Love the red glass vases and that reindeer.